Joe Bushman's 13-year run as head football coach at Clackamas High School has ended, and he will become offensive coordinator and quarterbacks coach at Lewis & Clark College in Southwest Portland. Bushman, who also coached girls' golf at the school, first announced his Clackamas departure in an emotional meeting with his players Friday. The new job with the NCAA Division III Pioneers starts next month. "I didn't make this decision lightly," Bushman said. "It has been really hard, but it's something that I just felt my heart was leading me to do. "It's something that I've dreamed about and thought about for a long time. It all came together really fast. I was offered the job earlier in the week and spent all week going back and forth whether to take it." Bushman was aware that Lewis & Clark had an opening for an offensive coordinator after Isaac Parker left to become the head coach at Willamette University in Salem. But he only learned that he was being considered for the position after Pioneers coach Jay Locey showed an interest in recruiting two Clackamas players -- inside linebacker Jake Bushman, the coach's son, and offensive lineman Brian Espinoza. "Jay wanted to come to meet with Jake and Brian, and then at the end of his text he wrote: 'I want to meet with you, too,'" Bushman said. "I kind of had a feeling that might be coming. "Lewis & Clark was one of the schools that Jake was strongly considering, but I didn't want him to feel like I was forcing him to go there. So, he went up there twice and met with their coaching staff and some of their players and he went to a class and came back really impressed and said, 'I feel good about going there.'" So, the Pioneers are getting a package deal -- an offensive coordinator and an inside linebacker. "I'm excited," Joe Bushman said. "Everything we set out to do here, we've done. I wanted to create a program that was as good as anybody's, and not just in terms of wins and losses, but as far as the development of kids -- making them better men, helping them academically, and helping them get to college. "I just love football. I love being with the kids and the coaches and all the strategy that's involved and … I just love everything about it. And now I get to go do it all day." Bushmen, 47, met with his football players and the girls' golf team in the library after school Friday. "The thing that makes it really hard to leave are the people in the room," Bushman said. "The players, all of my friends on the teaching staff and the coaching staff, I think the world of all of you. "I want you guys to know that I believe you're going to be in very good hands. Enjoy the ride. You're great kids and I really enjoyed being around you. It's hard for me to walk away when I know how good you're going to be." Espinoza, the senior lineman, said the news came as a shock to almost everyone in the room. "I'm surprised, but I figured a better opportunity might come his way down the line," Espinoza said. "Yeah, it's a little sad after being with him for four years. Unless the next coach is one of the former assistants, the program could be in for some growing pains, but they'll figure it out." In 13 seasons at Clackamas, Bushman compiled a 94-57 record and led the Cavaliers to their first state championship in 2017. This past season, the Cavaliers clinched a third consecutive Mt. Hood Conference championship and went 12-0 before falling the Sheldon in the semifinals. "It was a challenging year because of some situations, and it didn't need to be that way, but it was," Bushman said. "To our kids and our coaches credit, we kept the thing together and we were able to be successful. "Was it as enjoyable a journey as it could have been? No, it wasn't, and to me, personally, that was disappointing when you're coming off a state championship with some really good kids and then you end spending a lot of time dealing with a certain situation, it's a drag." 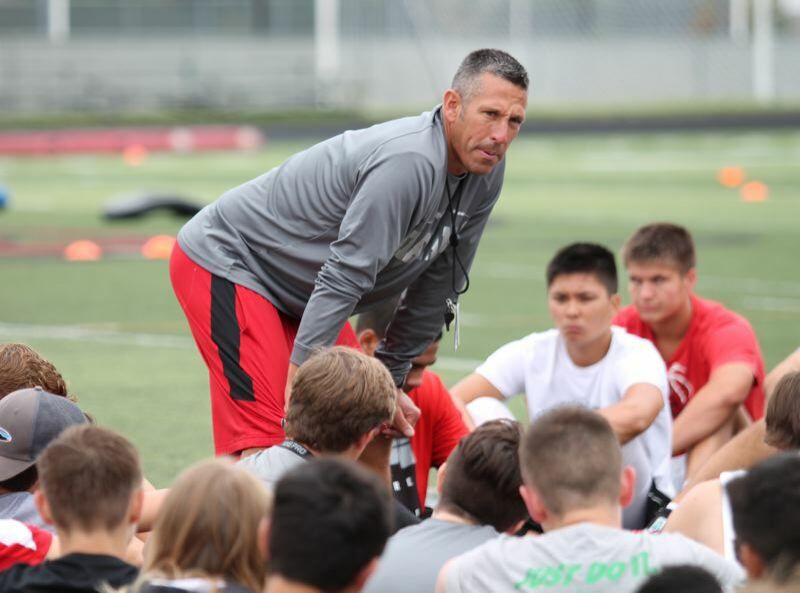 Bushman's decision also comes with a new high school preparing to open in Happy Valley in the next couple of years that is expected to split Clackamas High School's athletic talent pool in two. "I think the other sports won't be affected as severely as football," Bushman said. "If you look at any other school district that goes through a split, it's a challenge for awhile just in terms of pure numbers. "You look at our roster, you cut it in half, especially with our linemen … it's a different game. It was probably time to make a move here at some point." Bushman not only coached Clackamas to a state championship, but he also won a state championship as the starting quarterback for Benson's 1988 championship team. He went on to play college football at Lewis & Clark under Tom Smythe, but transferred after two seasons and finished out his playing career at Willamette University in Salem, graduating with a degree in biology in 1993. Bushman worked as a high school football head coach for 20 years -- five at Central Catholic, two at Lakeridge, and 13 at Clackamas -- and had an overall career record of 149-75. His time with the Cavaliers wasn't without several trials and tribulations, including a 0-10 season in 2010 -- the only time in Bushman's tenure at Clackamas that his team failed to make the playoffs. "It was the perfect storm," Bushman said. "Everything that could go wrong, did go wrong, but it taught me something about humility and faith in God. "We really dug into that youth program, and I mean we worked hard to keep our kids around, because we knew we had good kids coming. And I don't care what anybody tells you, you've got to have talent to win."